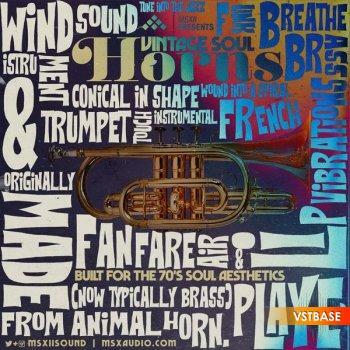 MSXII is proud to bring the Vintage Soul Horns! These horns were built for the 70's Soul Aesthetic project as a perfect pairing counterpart! Enjoy big, soulful, and stacked brass brought to you by beautiful horns as the Bb Bach Trumpet, Bb Bach Flugelhorn, Bb Lawler Trumpet, Bb Besson Cornet, King Tenor Trombone, with the Jo-Ral Harmon Mute. All recordings were tracked via FatHead Series short ribbon mics & UA preamps. You'll find unbelievable quality, musicianship, & stylings with the Vintage Soul Horns brought to you by new MSXII squad member Andrew Hoglund. Use these standalone to chop & use within your own production. Use these along side the 70's Soul Aesthetics if you'd like! Either way, you can't lose with these. Cop the Vintage Soul Horns and be a champ.